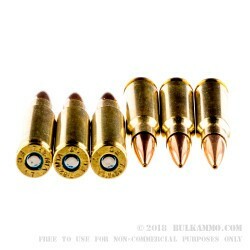 If you’re getting ready to compete with a long-range rifle, you need a good supply of match grade ammo to perfect your technique. 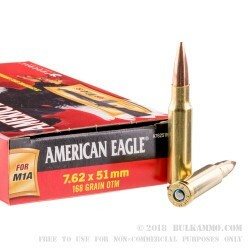 This 200-round case of .308 Winchester / 7.62x51mm cartridges uses a heavy 168-grain open tip match bullet that will shrug off environmental interference better than a lighter bullet while still maintaining a strong muzzle velocity of 2,650 feet per second. 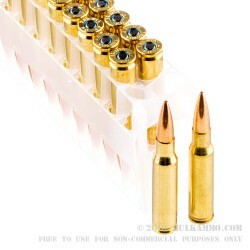 Ideal for use in the M14, FAL, or Remington 700. 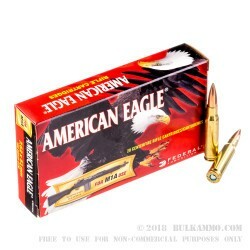 Federal Premium Ammunition is a leading US brand of ammunition with offerings in most market segments including match and competition, hunting, self-defense, and range/target ammunition. The company also manages ammo production for the US military as a division of defense contractor Alliant Techsystems. Federal has been headquartered in Anoka, Minnesota since its founding in 1922 and maintains its primary plant there; its military production takes place at Lake City Army Ammunition Plant in Independence, Missouri.